In the seemingly endless war against cancer, UNT faculty and alumni are drawing their battle lines. UNT alumnus Tom Weger wins award for works on Chisholm, Great Western Trails. To ready students for high-tech careers, UNT offers 13 new degrees, with more on the way. UNT alumnus Rudy Reynoso rubs elbows with music royalty after winning a trip to the Grammys. Alumnus' desire to effect change led to UNT's Multicultural Center in 1995 and continues today. UNT alumnus Ed Stephan's hard work led to performing on a Grammy-winning album. UNT alumna Christine Williams' film named runner-up at the Denton Black Film Festival. UNT Presidential Citation honors Paul Poston Sr. nearly 76 years after he left UNT for World War II. UNT researchers develop new cutting-edge materials. Through collaborations and creativity, UNT advances research and industry partnerships. UNT history lecturer Deborah Liles edits book on Texas women's activities during the Civil War. UNT alumnus Simon Walker's fonts appear on high-profile media. The facility's two dozen machines lead to cutting-edge discoveries made by students and faculty. Air Force members are completing doctoral degrees at UNT as part of a unique program. UNT's Jacqueline Ryan Vickery finds youth use internet in positive ways. UNT alumna Yvonne Valdez makes mark in Hollywood as a film editor. This year's Dallas 500 features many UNT alumni, faculty and administrators. UNT professor Pankaj Jain explores how science and religion work together in Indian villages. Neale R. Chumbler has been named the new dean of UNT's College of Health and Public Service. The UNT Celebrity Chef Series will feature restaurateur Tim Love on April 23. UNT alumni Kayla Olson and Farrah Penn write young adult novels. Steven Glassner wants to impact his own students the way his UNT professors influenced him. UNT alumnus Ryan Hooks helps services and revenue soar at Frisco's iFLY. Diane Bruxvoort will serve as UNT's new dean of libraries beginning April 1. Assistant professor Justin Watts was a model at a fundraiser for the American Cancer Society. UNT alumnus Jonathan Camacho's music heard in many places, including ESPN. UNT continues strides to better serve students with more options. Mariela Nuñez-Janes' story is all about helping migrant and Latino youth tell theirs. How can you grow a garden using native plants? UNT's Shay Youngblood sees works performed by top theater, Viola Davis. Son finds old panoramic photo while cleaning out his father's home office. Jane Goodall will speak at UNT on April 9 as part of the Distinguished Lecture Series. UNT graduate student is working to save her disappearing language. Go to class, elope, take final -- alumna looks back fondly on her college years. Shan Gao recalls how her experience in Chile changed her views on wilderness. Colleges collaborate to host International Conference on Entrepreneurship and Family Business. Nobel Prize-winning biologist Randy Schekman will bring his knowledge to UNT for two lectures. UNT alumnus Daniel Rojas' guitar work heard on major movies. Alumnus recalls a 1956 incident from his North Texas days. The UNT System's universities serve, inspire and drive the North Texas region. A team of logistics and supply-chain management students wins top prize at Operation Stimulus. Scholar-activist Rosa Clemente delivers keynote address at 2018 Equity and Diversity Conference. UNT alumni Drew Zaremba and Garrett Wingfield win 2018 Herb Alpert awards. Read about what some alumni shared on Facebook about their memories of snow days on campus. This year’s winning UNT love story was hard to beat. The Osher Lifelong Learning Institute at UNT will host its summer kickoff May 16 at Apogee Stadium. Two UNT alumni are fighting one of the most common forms of cancer. 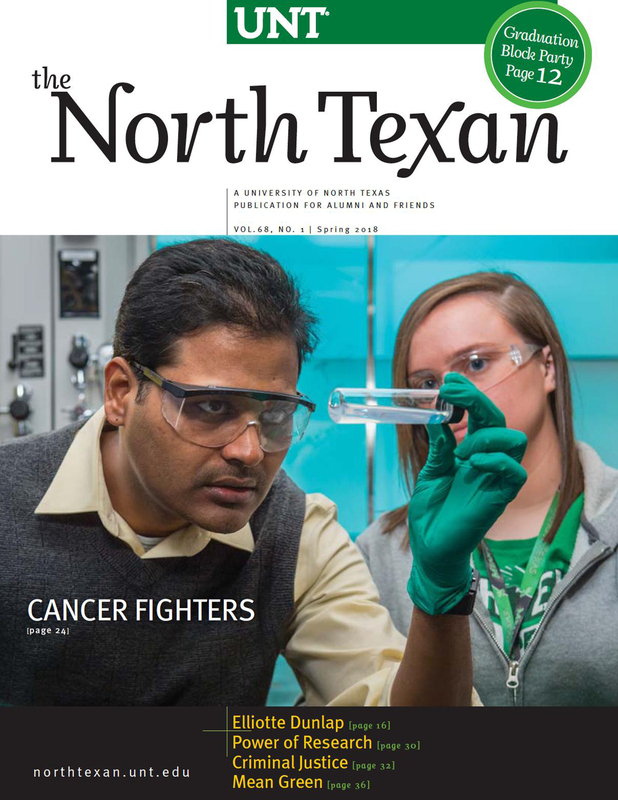 UNT faculty and students are making impacts with their cancer-fighting research. The Diaz quints complete their journeys as UNT students.